Calm and quiet, mild and melodious voice of chanting the glories of Sri Sakkarai Amma and Sri Lalitha Sahasranamam (adoring the Almighty in the manifestation of feminine form depicting cosmic energy) in the air, pleasant aroma from flowering trees and plants all around make the temple of Sri Sakkarai Amma different from other traditional ones. The serene atmosphere ever present in the temple pacifies any troubled or agitated mind engrossed in worries and immediately grants peace of mind that has been hitherto unattainable. With the grace emanating from the sanctum sanctorum of Sri Sakkarai Amma, one could easily feel good, regain self confidence and solace, recharge all energy points in the physical body. Sri Sakkarai Amma is the embodiment of eternal bliss and merciful, compassionate as much as the real mother toward her infants granting whatever they seek and also whatever is good for their well being. For those familiar with Thiruvanmiyur area in Chennai that is Madras, it may not be difficult to locate the temple of Sri Sakkarai Amma. It is situated at the spot where Kalakshetra Road and Kamaraj Road of Lakshmipuram locality more or less meet. The temple has two halls, one for chanting various names of Gods and Goddesses in praise and the other for discourses and concerts of devotional songs. One of the halls is used to provide free medical treatment in the morning on every Thursday by eminent physicians irrespective of caste, creed, or faith. 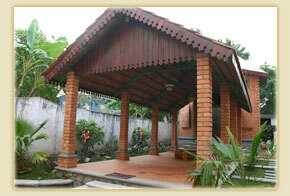 The hall is also used to teach art and crafts, as well as devotional songs for children. This hall is named “Dr MCN Memorial Hall,” where activities of Bhagwan Sri Satya Sai Samiti of Thiruvanmiyur are carried out. The discourse hall is also used to teach spiritual scriptures such as Bhagavat Gita. Devotional programmes by “Bhagwan Ramanar Sat Sang” are conducted at the hall in the evening, on the third Sunday of every month. 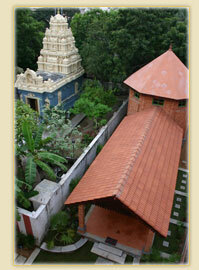 The salient feature of the temple is the spacious Meditation Hall in the premises. Even mats are provided to those who want to sit there in meditation. The still and aesthetically set atmosphere serves to easily concentrate in the meditation. The true to life idol of smiling Sri Sakkarai Amma’s graceful and benevolent looks help to experience bliss during the meditation. Along with Amma, Sri Krishna, the symbol of pure love and devotion, Nataraja, the Cosmic Dancer depicting untiring as well as amazingly precise and fast movements of the stars and planets in the universe, Buddha and Jesus are adorning the walls of the interior to encourage meditating devotees. The temple was built on the Samadhi (resting place) where Sri Sakkarai Amma was laid in 1901 at the initiative of her prime disciple Dr. M.C. Nanjunda Rao. Sivasri Arunachala Sivachariar, head of the Komaleeswaranpet Mutt and the brother of Sri Sakkarai Amma performed Maha Kumbabishekam of the temple when it was ready for functioning in 1901. He was also conducting regular pooja in the Srine. Since his passing away, his descendants have taken up the responsibility of performing pooja till date. They are in the order of descend: Siva Sri Seshadri Sivachariar, Siva Sri Theagaraja Sivachariar, and presently, Siva Sri Balasubramania Sivachariar and his sons. Probably, Dr M C Nanjunda Rao desired to be with his Guru Sri Sakkarai Amma for ever. He was also laid to rest in the temple premises. 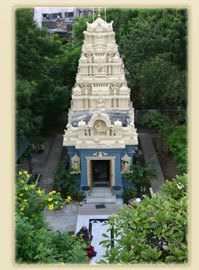 A bust size statue of Dr. Rao is installed over his samadhi at the temple premises. After constructing the temple, Dr. Rao left sufficient funds for its maintenance, clearly instructing his descendants to administer the temple from the self generating resources, not accepting any contribution or donations from others. Before discarding her physical frame, Sri Sakkarai Amma told Dr Nanjunda Rao that her Samadhi would draw people from every nook and corner only after the lapse of a century. Her saying came true, as the temple was renovated in 2001 and Maha Kumbabishekam (religious ceremony to signify the competence for regular worship) was performed in the year 2002. Since then, words spread about the spiritual significance of the temple through the media and by mouth to mouth; devotees started attending the temple regularly. Their number increased rapidly, as many found their prayers heard and wishes fulfilled. The temple has also become the chosen place for spiritually advanced persons, who experience the bliss through the benevolence of Sri Sakkarai Amma. The late Dr. MCN Private Religious Trust is maintaining the temple with Dr. Rao’s grand daughter Smt. Sumana Suresh taking care of the management. In accordance with the wishes of Dr. Rao, the Trust does not accept any contribution or donations from others. However, devotees can arrange offerings of prasadam (flowers, fruits, sweets, etc.) at the temple in person during poojas (ceremonial worship).